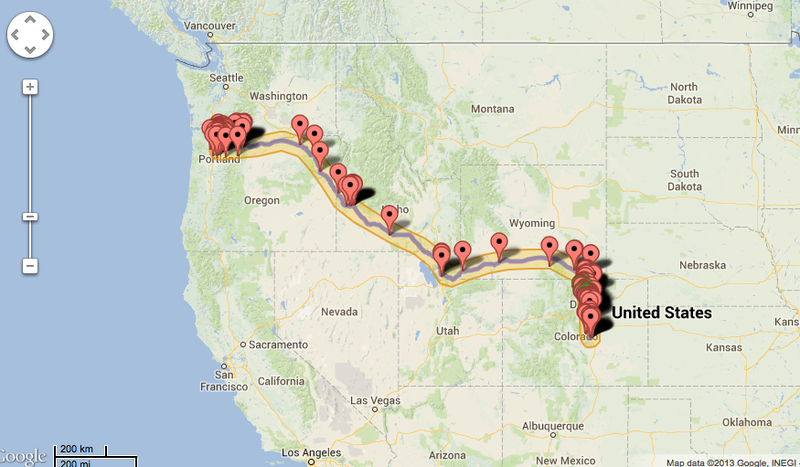 This is a map of all the breweries from Colorado Springs to Portland. I’d like to direct your attention to a pretty amazing tool that I wish I knew about during my drive from Colorado Springs to Portland. BreweryMap is a pretty intuitive website where you can find all the breweries between you and your destination point on a road trip. It’s super simple: enter a start destination, an end destination, and a radius mileage for departure from your route, and watch the breweries appear on the route! The online map pulls breweries up via Google Maps, and you can easily visit a brewery’s website from the list they provide in a left column, or from the dropped pins. You can zoom in and out very easily as well. You only get one option for a map, it looks like the fastest route, so if you’re taking a scenic route, you would need to get a little creative in your search options. BreweryMap is also available as an app for iPhone and Android. It’s as easy as the website, and I like it even more as an app because I can have options for selecting a production brewery, brewpub, nano-brewery and more. Finding info about the brewery is slightly harder than the website, but you can zoom in on the map and then click on a brewery’s website easily. You can also search a list, but it’s ordered by alphabetical city. I bought the app for $0.99 because the ratings were really high and the reviews looked good with words like “simple,” “very handy,” and “works great.” It’s not a social media tool, so no checking in or keeping tracks of where you’ve been, it just does one thing and does it well – helps you find breweries along a route, or near your current location. It’s easily worth the one buck. Speaking of maps, Wired also pointed me to this really cool interactive map that has some really, super interesting information about the beer industry, including which states are seeing the most new breweries, breweries per capita and much more. Check it out. Cheers!